Scania’s dutch fleet has gone internet savvy. When Scania delivered 164 Scania OmniLink and 47 Scania-Higer A30s to EBS for use in Holland last year, all the vehicles were equipped so passengers could access the internet while on board. 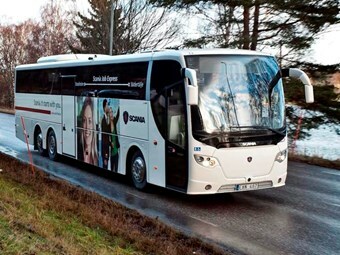 And when Scania recently delivered new buses to the operator Nobina for Dalatrafik’s Borlänge–Sälen route in Sweden, those buses also were internet access equipped. "We monitor usage and have found that an incredible number of passengers take advantage of internet onboard," says Ulf Johansson, Area Manager for Nobina in Borlänge. "Nowadays, young people are already connected before they’ve even boarded the bus. And in our experience, it works well." Internet on buses, especially in regional traffic, is becoming increasingly common. The technical preconditions to provide passengers access through the 3G network exist, but they should not expect the same speeds as at home or at work. "If you think that you can get 40 Mbit/s, you’re wrong since all modems and handsets share the same capacity from a mobile radio cell," says Håkan Larsson, Managing Director of Oxyfi, which has delivered the internet solution for the Scania Job Express. "It’s therefore difficult to guarantee a given transmission speed. It all depends on the operator’s or operators’ traffic load – at that particular moment." Since the end of last year, the Scania Job Express offers a bus service for Scania employees on their 35-km commute from the capital Stockholm to the Scania Södertälje Head Office and factory. Clearly conveying realistic expectations is essential, according Brord van Dusseldorp at Mcom, which was responsible for providing Internet access on the EBS vehicles. "Establishing a good connection is important but we also need satisfactory usage models since bandwidth will always be limited," he says. "We inform all passengers on the portal page that usage is limited to one hour a day. Without a fair and clear policy we would face disappointed passengers." "We’re still in the process of establishing a reasonable time allocation model," Brord van Dusseldorp says. "We know that two hours is too much but cannot be certain if one hour is the limit. We must take into account both high and low frequency traffic. When passengers are mostly elderly, usage may also be lower compared with a bus full of students." On Dalatrafik’s routes, Internet access is so far unlimited while the Scania Job Express after one month of service doubled the speed from 1 to 2 Mbit/s with a maximum of 1,000 MB data volume per month. "When, as a user, you go online it is immediately apparent what you can and can’t do on the net," says Håkan Larsson. The 3G network is used for communications on the Scania Job Express but since the E4 motorway between Stockholm and Södertälje is one of the world’s first areas with full 4G coverage, it might soon be feasible to switch to a faster net.